We will not share, sell or disclose your email address to anyone. Divorce Advice for Women from Women Who Know! 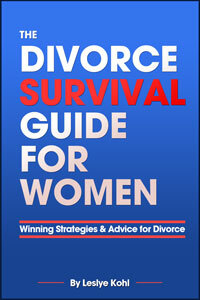 The Divorce Survival Guide for Women is the definitive source for Divorce Advice for Women. Written by Leslye Kohl, a formerly happily married housewife, and filled with contributions and insight from a number of women who have gone through divorces, The Divorce Survival Guide for Women is dedicated to providing divorce advice for women that helps them intelligently prepare for divorce. Divorce is one of those things you think you know all about until it happens to you. And to those who have been through the divorce process without proper preparation, it can spell financial devastation. There are multiple ways that your husband and his lawyers can ruin your finances, so DO NOT allow yourself to be a victim—learn how to prepare for divorce successfully and how to protect yourself with The Divorce Survival Guide for Women. Knowledge is the key to success. Knowledge is power! Limited Time Offer!!! Get a Sneak Peek At the Divorce Advice That Can Change Your Life! Prepare For Divorce – Everything you need to know to prepare for divorce. Your Financial Security – 15 important steps to financial security. Divorce Options – Mediation, Arbitration, Collaborative, and Uncontested Divorce. Finding a Lawyer – Learn the best way to interview and hire an attorney. What to Expect Your Husband to Do – 15 ways he can hide his assets, and how he can play with your emotions and cloud your decisions. Your Husband’s Attorneys – What you should know. Learn how they think and strategize. Legal Fees – Learn what’s fair and how to avoid receiving unexpected bills from your attorneys. Settlement – How to receive a fair and equitable settlement. Depositions and Trial – How to be prepared. BONUSES: For a Limited Time Only, get these FREE Bonuses when you buy the eBook! 3 MORE Important Steps to your Financial Security! 6 MORE ways your Husband can Hide his Financial Assets! Prenuptial Agreements – What to include, what to avoid, and critical advice every woman needs to know before she signs on the dotted line! Wills – Valuable information you MUST KNOW about Wills and Divorce! Blog – Leslye’s quotes and notes. Charpie v. Charpie – A New York Appellate Court decision and a “must read” for any woman facing divorce! I know that my eBook will be helpful to you, in fact I GUARANTEE IT! I can’t promise that you will win your divorce armed with this information, but it will help you to fight a “mighty” battle and come out much better off financially than you would without the information I have given you. Knowledge is the key to success. Knowledge is power. If only I had this information when I was going through my divorce, the financial outcome would have been very different! 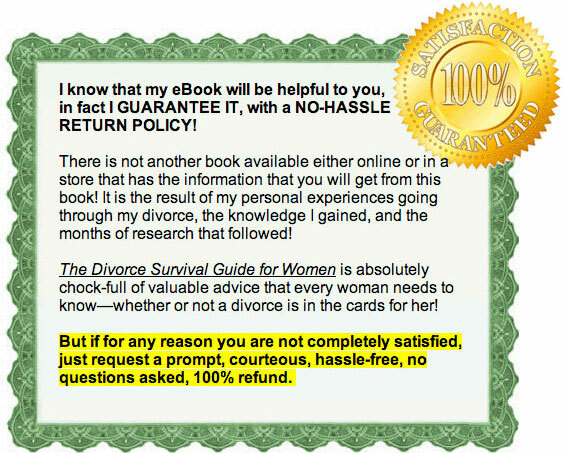 After making your purchase you will be redirected to a page where you can easily download and read The Divorce Survival Guide for Women eBook. Nothing is mailed to you, this is a digital product only that is instantly accessible after your purchase.